P.P. Erawan Palms Resort is centrally located on Laemtong Beach, Phi Phi island. Local people call the place the cape of God, because of the heavenly beauty of the landscape. The hotel was opened in 2003. The resort offers two types of lodgings with a sea view – beachfront villas which are close to the coast and accommodations nestled high upon a hill. Both room types that give you the chance to see the ocean. Hotel’s buildings are amphitheatrically set on a green slope and are well integrated into the tropical nature. Suites at P.P. Erawan Palms feature Thai décor. 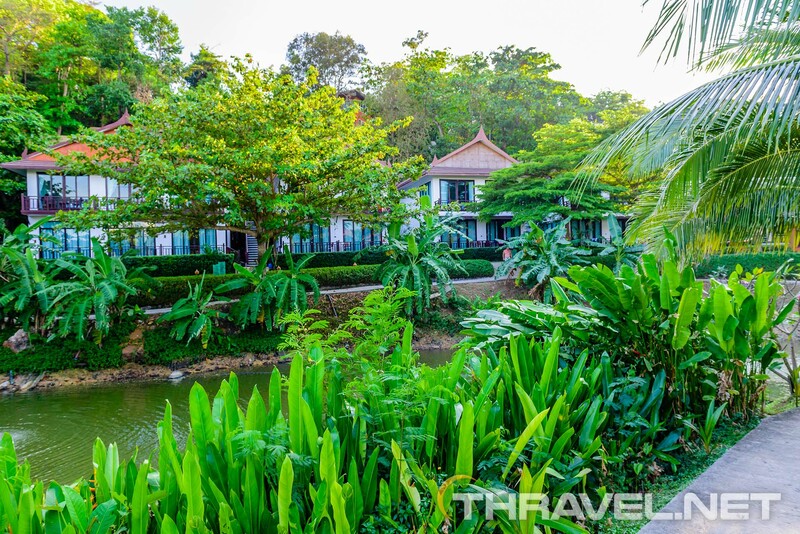 There is a lake in the middle of hotel’s premises, which is surrounded by rich tropical vegetation. Still, the beach is the place that attracts most of the guests. Close to the coast are the outdoor pool, the beachfront restaurant Sawadee with a live music at evening, the SOLO bar and the wellness zone. No matter how many efforts the hotel’s management put to entertain the guests, there is no nightlife in this secluded part of Phi Phi Island. Walking along a moonlit white sand is probably the most interesting thing you can do after dinner. P.P. Erawan Palms Resort offers comfortable lounge chairs on the beach. The violet tinted umbrellas contrast with the green crowns of palms. Wooden sunbeds are paired with comfortable bean bags. Even the free Wi-Fi is stronger close to the beach. During the day, P.P. Erawan hotel guests can use sunbeds and umbrellas of the Phi Phi Natural resort. It is 3-4 minute walk. From there they can admire the long white sandy beach. It is an option for people who are annoyed by the long-tail boats anchored up on the resort’s beach. Due to the central location on Laemtong beach, PP Erawans’ beach is frequented by tourist from other places of Phi Phi Island. The daily tourists arrive just in front of the hotel. P.P. Erawan Palms Resort can be reached by boats from Phi Phi Tonsai pier. Tractor come to the pier to collect tourists us from the pier to the hotel’s reception. P.P. Erawan Palms Resort is located next to a group of small typical eateries. Between Erawan hotel and Holiday Inn resort, there are 4-5 restaurants offering local Thai and Chinese food at relatively affordable prices. Jasmin restaurant is a nice place with good food and nice Western music. The restaurant is a sponsor of the local school located in Phi Phi Natural resort. They charge each client with 2.5 percent and donate the money for the education of local children. Here are some prices in Jasmine’s menu in 2017: fruit shake (pineapple, banana, lemon) – TBH 80; a bottle of wine – TBH 1200. The Chinese restaurant next to Jasmin is the most affordable one and offers very tasty meals. Inside the building we found the biggest market on the north coast of Phi Phi Don. Prices are 2 times cheaper than in hotels. For example, a bottle of Chang beer (600 ml) is TBH 80 while in hotels the price is TBH 150-200. Nuts, biscuits and chocolate are also half price compared to resorts ‘shops.